Areteem’s School Events for 2014 So Far! Beyond our concentration in mathematics and science programs we have been reaching out to various education organizations as well as becoming members of them. Part of our involvement with these groups has entailed attendance at their yearly events. In January we participated in the Fourth Annual Preschool-12th Grade Fair on January 5th at the Irvine Marriott Hotel held by the OCPSA (the Orange County Private School Association) for private schools in Orange County. At events like these we usually bring along our booth and talk with families about our programs such as the onsite and online classes, our summer camps and any other activities that we are currently doing. We were able to meet with many families at this popular event as well as talk to other administrators representing a variety of private education institutions across Orange County. Other organizations that Areteem is proud to be a part of are the California Association for the Gifted (CAG)and the National Association for the Gifted (NAGC), both of which help gifted students as well as supply resources to inform educators and parents how to best benefit and provide for advanced students in the academic world. Our school sent representatives from our administration team, including yours truly, to network with schools and gifted groups at the CAG’s 61st Annual Conference in February. It was a fun three day event as we were able to attend different lectures by educators to learn more information about what is “in the know” with gifted education. 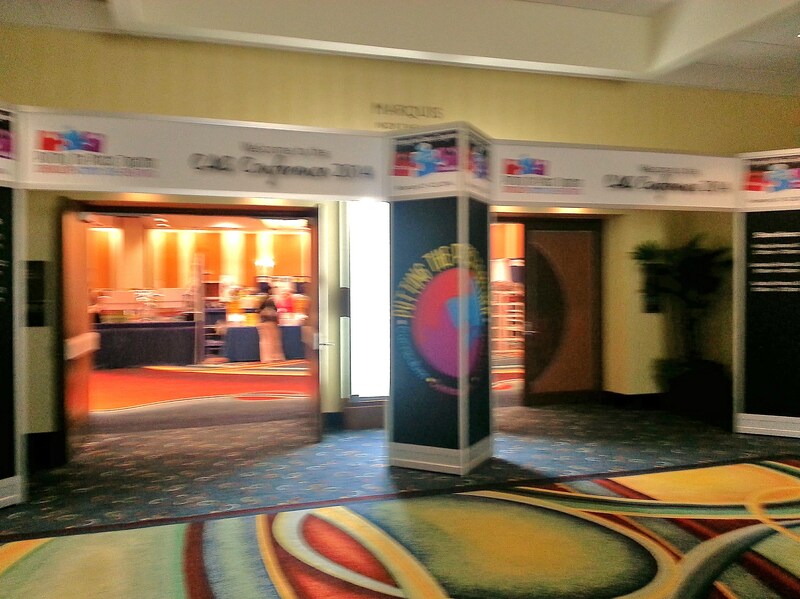 It was held at the Anaheim Marriott Hotel, right across from Disneyland, and it was quite a warm season then for us! All throughout the rest of February and early March we were happy to have sent out many scholarship certificates to students participating in both local and regional MathCounts competitions all across the USA. Math Counts is one of the many competitions that our students participate in as our classes have helped students to better compete in these competitions (please refer to our website for more details about the individual competitions). 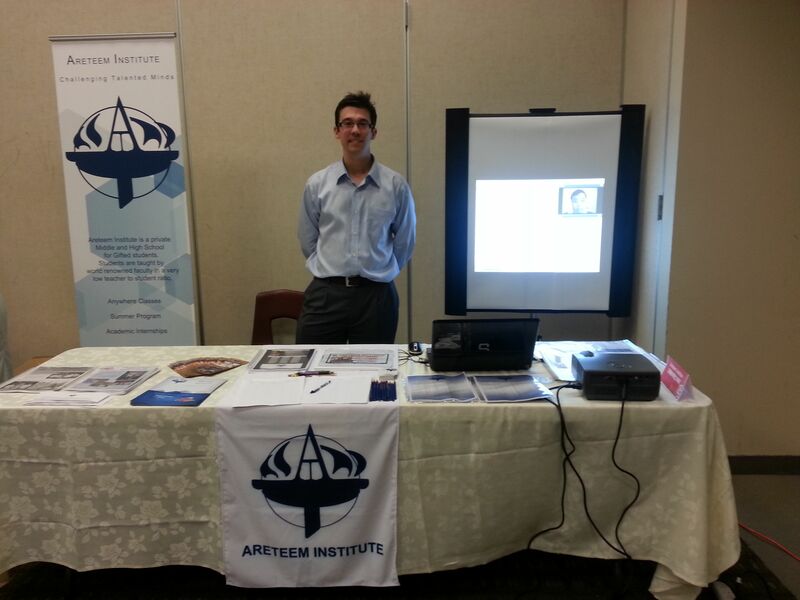 We want to wish congratulations to all of those students who received a certificate from Areteem Institute! In April we were involved in two big events to help spread news of our school! On April 12th, we attended the Irvine Chinese School close by our Irvine office location for an education fair hosted by the Chinese language daily newspaper, the World Journal. This event allows Chinese-speaking families in Orange County to come and learn more about how to better prepare their students for college and what programs can help them to achieve this goal. At this event we demonstrated how our online classes work by showing families video recordings of some of our math classes taught by our academic director Dr. Kevin Wang. Recently on April 26th we were proud to sponsor the first STEM Festival (for science, technology, engineering and mathematics) at the LA Math Field Day at Glendale High School, bringing together students from fourth to eighth grade across Los Angeles county schools to compete against each other in a morning full of challenging competitions! After the students had completed their last round of competitions we were asked to arrange a series of activities for each grade level that pertained to the STEM subjects. We invited many participants to come join us including Bob Barboza who engaged the fourth graders with a sound display where students created music just by moving their hands across the surface of a machine without touching it! 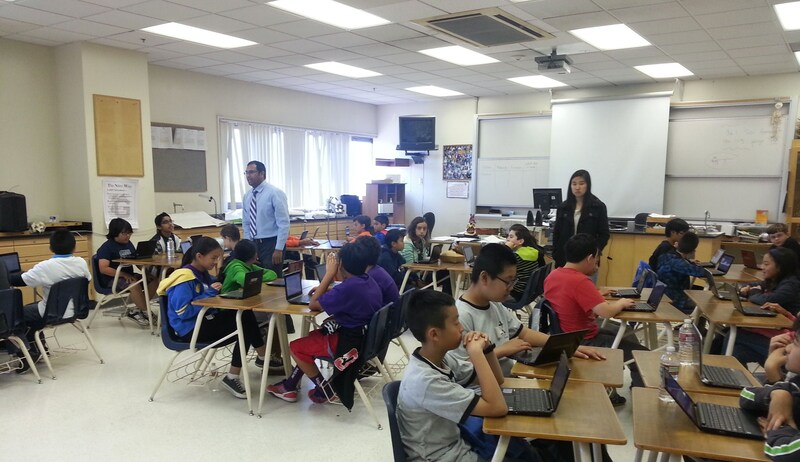 The six graders were treated to back-to-back sessions with Saifur Rahman, one of our school’s technology teachers, giving students an introduction to video game design on mini computers (see picture above) and our director Kelly Ren leading students through a series of mental math challenge games. The seventh and eighth grade students were involved in some engineering work when they had to create their own unique paper airplanes by using different materials, a lesson conducted by the education outreach of the Casio company. By far the “best of show” at the STEM Festival was Chef Mauro Rossi who brought along his colleagues and student cooks from The Art Institute’s North Hollywood campus for some cooking experiments. This institution allows its students to master the visual and culinary arts, amongst other areas of interest. Mr. Rossi and one of his colleagues led students through a series of science-focused activities where in one classroom they had to mix different liquids and substances together to create edible food while in another classroom students had to taste-test tea and coffee and access the quality, color and content of both. The students ended up having a blast and were able to take home a few worksheets and edible concoctions! We were so lucky to have such talented people show off their stuff before the different grade levels. At the end of the event we handed out trophies and Areteem backpacks too students in attendance, what an exciting day it was! 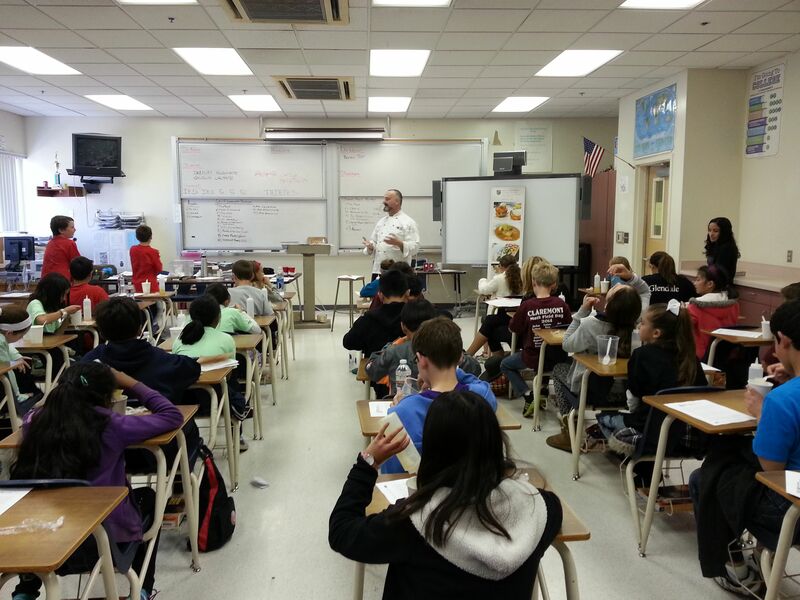 Chef Mauro Rossi of The Art Institute and the Fifth Grade students experimenting with FOOD! We are continuing this rush of enthusiasm as we will also be part of the OC Math Field Day hosted by the OC Math Council that is coming up on Saturday, May 17th at Capistrano Valley High School. We will be participating in a number of activities as guest judges as well as be present to answer any questions that people may have about our school and its programs. We plan on giving out goodie bags to all students present at these day long competitions so we hope to see many people, including maybe some of you, there! This summer we are radiating with so much activity from our college residential summer camps, our onsite weeklong summer camps in Irvine and around OC as well as our summer online classes, you should check out both of the websites for Areteem and Math Zoom for more details! Thanks everyone and look for more up-to-date information from the Writing Whisperer here at Areteem Institute! ← What kind of opportunities can arise of a High School internship?